Today I welcome author Gail Aldwin who is sharing a very creative #TenThings. As you will see, there is a common theme throughout as she shares her passion for paisley. Gail Aldwin is a prize-winning writer of short fiction and poetry. 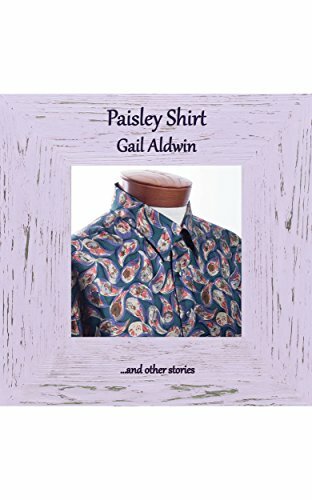 Paisley Shirt, her new collection of short fiction is published by Chapeltown Books. Paisley Shirt is available to order through the Book Depository (no postage charges incurred) and from Amazon. In 1981 I joined a bus trip from London to Kathmandu. With seventeen others, I lived on the bus for three months, sleeping on a bunk upstairs and helping to cook downstairs in a mini-kitchen. Four nights of luxury came when we stayed in Kashmir on a houseboats floating on Dal Lake in Srinagar. The original design for paisley pattern comes from Kashmir, so it’s good to have a publication that remembers the journey. I grew up in the 1960s and shared a bedroom with my brother. He had the top bunk and I had a paisley pink eiderdown. Whoever uses the word eiderdown these days? Paisley patterned shawls were a must-have item for Victorian women. Shawls from Kashmir were offered as gifts to middle class women by relatives returning from India. Copies of the pattern (made from wool rather than cashmere) were mass-produced in Paisley, Scotland in the mid-1800s. I spend a week in Edinburgh each summer so that I can visit the Edinburgh International Book Festival and attend fringe events. This year I am also planning a trip to Paisley to check out the shawls at the town musuem. Another link to Scotland comes from my first husband. He was brought up in Prestonpans but went to Australia as a ten-pound pom. I met him in Tenant Creek an Outback town. Her persuaded me to travel with him to Cairns where we were issued with a marriage licence and wed twenty-four hours later. My poor parents couldn’t understand the rush but there’s nothing more exciting than a whirlwind romance! I’m losing the paisley thread here as I mention the two years I spent living in in Enga Province, Papua New Guinea. Writing about the experience earned me a prize in the Bournemouth National Poetry Day competition 2016. I studied North and South (1855) by Elizabeth Gaskell as an undergraduate at Kingston Polytechnic. The novel is set in a textile town in the north of England. Given a shawl by her mother, Edith is so swamped by the fabric that she prefers to use the paisley patterned garment as a picnic blanket. A revival in the popularity of paisley pattern came in the late 1960s heralded by The Beatles who became immersed in eastern influences. I understand John Lennon painted his Rolls Royce in the pattern. The title for my collection, Paisley Shirt comes from a story about Auntie Maggie who is reminded of an earlier relationship when a visitor wearing a paisley print shirt calls at her house. Paisley Shirt is published by Chapeltown Books who have a series of square-shaped books each containing a distinctive collection of short fiction. I’m lucky to be in the company of other authors such as Mandy Huggins and Anusha VR. After years of living in south London my family moved to Dorset. It was Olivia Pass of Charmouth who invented Dorset Feather Stitchery in the 1950s. This is a style of embroidery has an uncanny likeness to paisley pattern. I hope you enjoyed learning about my #TenThings and that you join me in celebration of the power of paisley! Thank you for inviting me to share my #ten things, Joanne. it was such fun! Learnt quite a lot more about you, Gail. You really should write a memoir on that world bus trip. It would be absolutely fascinating. I think a memoir more than a novel, because people love reading a real adventure story or extraordinary experience from the author her(him)self. What a great post! I learned things about Paisley and about Gail and her writing.